One hundred and seventy-three years ago today, Republic of Texas President Mirabeau B. Lamar made a fateful decision that widened the rift between he and former President Sam Houston. A sleepy little hamlet called Waterloo was approved as the capital of the new Republic of Texas. It was an unpopular move with many Texans because Waterloo’s remoteness and its vulnerability to Indian and Mexican Army attack. The detractors had a point, while Waterloo was not the furthest western settlement in the Republic, it was still on the bleeding edge of the frontier. It was smack dab in the middle of Comanche and Kickapoo territory and along the route the Mexican Army would take should they choose to reinvade Texas and take it back from the usurper colonists. So why pick Waterloo? Take a look at the map below and notice where the cities in the Republic were. It’s not a perfect map, it’s perhaps a little too new for our purposes, but it does illustrate a point. Most of the settlements in Republic-era Texas were either near the coast or in the case of Nacogdoches, in far East Texas. Let’s compare that to this map. Texas had claimed a huge swath of land in the disputed Treaty of Velasco. The area the republic claimed was almost the size of Mexico itself, but with a fraction of the population. Three-fourths (or more) of the Republic had no settlements of any kind. Lamar reasoned that if Texas was to claim that huge area, they would have to have a capital near the center of it. He settled on Waterloo after a tour of the area and seeing its natural resources and beauty. Lamar was looking to the future, a future where the entire republic was settled and an administrative capital central to all its cities. Houston was much more practical. Some historians speculate that Houston merely wanted to hold on to the claimed territory until the United States could annex the republic, seeing the land claim the Republic made as too daring by far. Lamar thought independence would stick. Either way, in 1839, the capital was moved to Waterloo and renamed after Texas’s most senior founding father, Stephen F. Austin. The idea of founding a central capital in claimed territory is not unknown. The city of Brasilia, the Capital of Brazil, was laid out from the ground up in 1956. Previously, most of Brazil’s population centers were on the coast. Brazil is a huge country and claimed huge tracts of land in the Amazon Basin that are remote and lightly populated, but also the home of one of the country’s biggest industries, timber and the vast Amazon jungle. Austin had a precarious place in Texas history. People constantly wanted to move it. One of the State Cemetery’s most notable Texas patriots was involved in one of those disputes. Thomas William Ward, otherwise known as “Peg Leg” Ward, was ordered to take the government archive from Austin to Houston for “safe keeping” by Sam Houston in 1842. Ward was head of the General Land Office at the time and he and a few soldiers attempted to take the archives in the middle of the night. Austin residents were rightly afraid that if the archives were removed, their city had no future. A quick thinking Angelina Eberly fired on Ward with the town cannon and prevented a majority of the archives from being removed and Austin was safe. 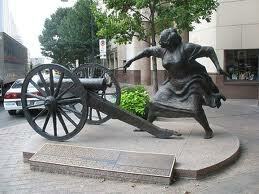 A statue commemorating Eberly and her actions is on public display on Congress Avenue in Austin. Another Cemetery plotholder was responsible for surveying the town in 1838 before it was officially the capital. Edward Burleson, the first man buried at the Cemetery and a Vice President of the Republic of Texas, laid out the first city plan. Jessie Cornelius Tannehill, an early Texas settler, laid out a town he named Montopolis in 1838 at the same time Burleson was doing his work. Montopolis didn’t survive as a separate city, but an Austin neighborhood where he laid out his town still bears the name Montopolis today. Another prominent Cemetery plotholder, Edwin Waller, was Austin’s first mayor. So, 173 years ago today, the city of Austin was given its future. Not a sure future, one that was under constant threat of being taken away, but a future none-the-less. Perhaps that’s where Austin’s weirdness comes from, a fear that any day someone will come in and take away what’s most important.